We Americans have a knack for sticking out abroad. In the waterfront village of Sao Mateus da Calheta, on Terceira Island, summers bring mini bull-runs called touradas a corda, in which bulls rampage through the streets tethered to a few brave souls by ropes. After pelting poor Ferdinand with soccer balls and curses, the villagers jump into the water when he charges after them down the dock. American tourists, on the other hand, stand there taking pictures, because it would make a great addition to their Snap story. Or at least I did, until I looked up and realized there was nothing between me and the infuriated beast. Survival instincts kicked in; I turned and sprinted through the crowd so I wouldn’t be first in line for gorging. As I ran, someone in the water chucked an object at the bull, who promptly lost interest in me and turned his attention back to the dock. “You all don’t have liability laws here, do you? !” I asked my guide as I gasped for breath, joining her above the marina. I’m not sure if she understood, but in any case she just calmly watched the hysteria below and continued enjoying her ice cream. Terceira, one of nine islands in the Azores archipelago, has seen its share of Americans (it’s home to Lajes Field, a U.S. Air Force base). But the brazen tourist was a new variety. Over the past decade, the number of military personnel has shrunk from several thousands to a few hundred -- but the island is filling the economic gap with tourism. And as more people discover the tropical, volcanic wonderland on these Portuguese islands, this may be the last year with only one picture-taking idiot to laugh at. 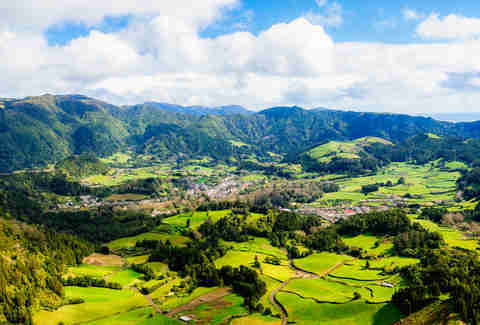 The Azores have been called “Europe’s Hawaii,” sitting 1,000 miles or so west of mainland Portugal and under five hours by plane from the US East Coast. Historically, it’s been a proud but poor area, where agriculture was the main economic driver. Only a handful of in-the-know Europeans made the flight for vacation, and had the breathtaking waterfalls, volcanoes, and geysers all to themselves. But word has gotten out. It’s still an under-visited gem, but it’s on the top of everyone’s travel list. Which means it’s only a matter of time before it’s completely not-undiscovered. Especially as getting there becomes ridiculously easy. Vacation packages to the Azores islands are so cheap they don’t make financial sense -- the kind of loss-leading deals you’d expect to see trying to lure people to “the unheralded beaches of Central Arkansas.” Azores Getaways, for example, offers weeklong packages with flights and hotel for under $500. You’d be hard-pressed to get a week at a Motel 6 for that. 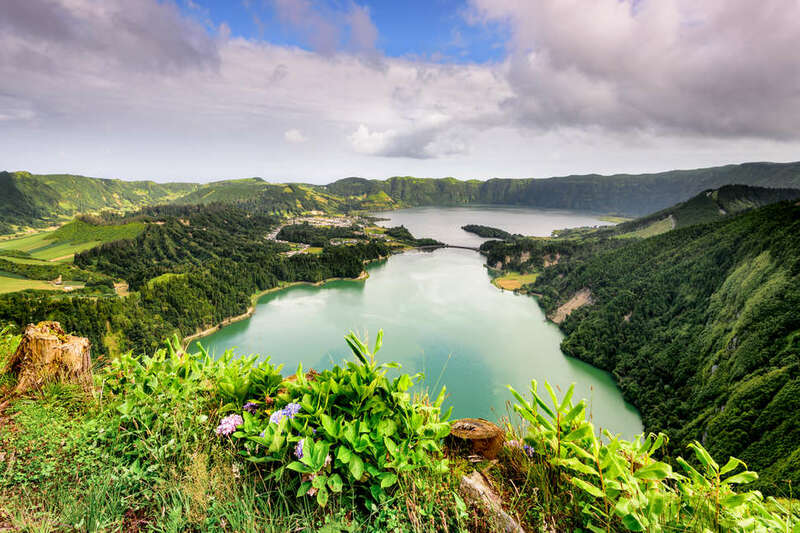 Though flights only leave Wednesdays from Boston -- on the quirky-yet-effective Azores Airlines -- packages are selling out fast. But those deals are relatively small-scale. To bring tourists by the thousand, you need big-time airlift. And the Azores got it this year when Delta Airlines, as part of a big push into Portugal, started a daily nonstop from JFK to Sao Miguel, the largest island in the Azores. Now, no matter where you are in America, you’re one or maybe two connections away from the Azores, and can fly in on a big, comfy 757. The runway in Sao Miguel can handle A380s and 777s in theory, so if other airlines follow suit, the potential for over-tourism is great. In the village of Furnas, on Sao Miguel, I’m sipping purple tea made with volcanic water, watching steam billow from geysers along the river. Furnas sits literally on top of an active volcano. That makes for interesting food scene, for a start. 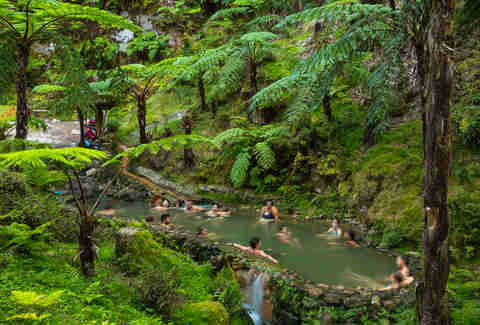 Here you’ll find farmers boiling corn in open hot springs, and kitchens serving cozido das Furnas -- a stew made of pigs’ ears, chicken, and vegetables, cooked underground by the natural heat of the volcano. Instead, the focus is on wellness getaways. It’s home to the Furnas Boutique Hotel and Thermal Spa, as well as the Furnas Lake Villas, an Asian-inspired retreat that’s about as close to high-end luxury as you’ll get in the Azores. “We’re not trying to build giant hotels here,” Paula tells me as she pours me a cup of coffee from the nearby island of Sao Jorge. This was a sentiment repeated to me by nearly all the locals I met -- sure, they want more tourists, but without the mega-resorts that often come with them. Whether they get their wish remains to be seen. 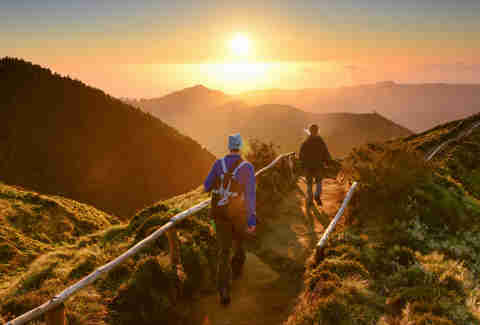 For now, there are no plans for gargantuan developments in the Azores that might ruin its character and natural beauty. But if airlift increases and money pours in, that temptation might be hard to resist. For now, even hotspots like Vista do Rei, with its grand views of the famous blue and green crater lakes below, is relatively uncrowded. I have to wait for two families to take pictures before getting my own shot -- compared to anywhere in Iceland it’s downright empty. 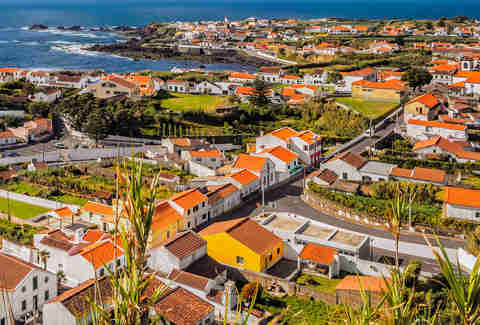 On Terceira, the UNESCO World Heritage Site of Angra do Heroismo is a city of colorful colonial-era buildings, still filled with little bakeries, galleries, and sundry stores. The city does get its share of cruise ships, but even the most popular places haven’t been taken over by schlock. Meanwhile, breezy Ponta Delgada (the largest city on Sao Miguel) has just enough tourists to keep things going, but not so many that it’s overrun. Drop onto the main waterfront drag and it feels like you’ve arrived in Honolulu in the 1950s, or the coast of Croatia before all the yachts showed up. There are big waterfront hotels, yes, but they’re not too imposing, or expensive. The new-ish Grand Hotel Acores Atlanticos is the kind of boutique-chic accommodation that would set you back a couple hundred euros in most of Europe, but rooms regularly go for less than $100 a night. The Azor Hotel, with its swanky rooftop bar where you can literally whale watch from a deck chair, is rarely over $200. The restaurants that line the water are a collection of local seafood joints and inexpensive steakhouses, with a few pizza shops thrown in. It’s another place where you’d be hard-pressed to drop more than $20 on a meal, even with a front row seat to the ocean. There are, of course, other islands with tiny airports, which feel almost as raw as when the Portuguese first arrived in 1427. Corvo, the smallest island in the chain, has less than 500 residents. Nearby is Flores, a UNESCO Biosphere Reserve that’s a choice spot for waterfalls and untrodden tropical hikes. And then there’s Sao Jorge, with its sheer cliffs, deep ravines, and famous coffee. Walking around the Azores, you get the feeling that this is the end of an era -- a time locals will refer to as “before the tourists came.” Steel and glass hasn’t intruded on the natural beauty quite yet, and it just feels like a colorful piece of paradise waiting for the world to wake up. And when it does, the selfie-obsessed Americans will come in droves. Matt Meltzer is a contributor to Thrillist.